After all the years I have spent translating the change agendas of organizations into the daily activities of their employees, I realize there is no silver bullet, no single solution to managing change. Change is the only constant. The key to successful mobilization, then, lies in the ability to demystify strategies and translate them meaningfully into the daily activities of every employee. The most strategic role that an HR leader can fulfill is that of “translator” — the right-hand person to the CEO who is able to successfully translate the leader’s vision, strategy and values in the day-to-day activities of every single employee in the business. This is what leveraging your “human resources” is about. During my tenure as EVP of Human Resources at Dr Pepper Snapple, CEO Larry Young recognized the strategic importance of our HR partnership. The impact of which is evident in our successful transformation from a subsidiary of Cadbury-Schweppes to the impressive publicly traded company it is today. Together, we were able to align 20,000 employees in numerous countries and diverse cultures behind the right priorities, while efficiently and effectively building skillsets critical to company success. The complexity of the new skills or processes: How realis­tic is your timeframe to allow individuals to acquire the new skills and operate to standard, using the new processes? The training, coaching, and support: To what extent will you provide assistance to accelerate the learning curve? The consequences associated with change: How meaningful are the consequences associated with change agenda? The deadlines and milestones for implementation: How will you clarify and communicate the target dates for completion? In this diagram, the timeframe is dependent on the complexity of the new skill or behavior being coached. The more complex or demanding the change, the longer the adoption time will be. 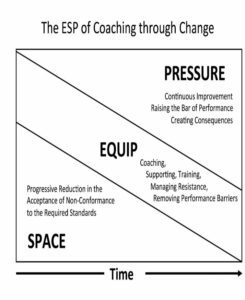 As leader, your role is to determine what the time for full adoption of the new should be, and to effectively apply the E, S, and P of coaching. Equip refers to the guidance, training, feedback, and support that will be provided to the team — or individual — in order to meet the new standards within the specified timeframe. This prepa­ration is ongoing throughout the learning journey. Learners must be clear about the training you will be providing, what the expected standards of new performance are, when they need to be meet these standards, and how you will determine if they have met them. There should be no surprises. The consequences of failing to achieve ex­pected standards must be unambiguous and consistently applied. Space refers to the leeway you will give as people work through the learning curve. How much wiggle room or below-standard delivery will you allow along the journey from the current to the new? As the visual illustrates, supported by regular feedback, this latitude needs to be reduced progressively as we move toward the deadline by which standards are to be met. Be sure to clarify expected standards of improvement at various stages along the learning journey and address obstacles to performance that might arise. Pressure refers to the amount of positive coercion you will ap­ply to consistently raise performance standards within expect­ed timeframes and to ensure that the consequences associated with non-compliance are understood. Implicit in this action is also the understanding that those who meet and retain new standards will be publicly recognized. 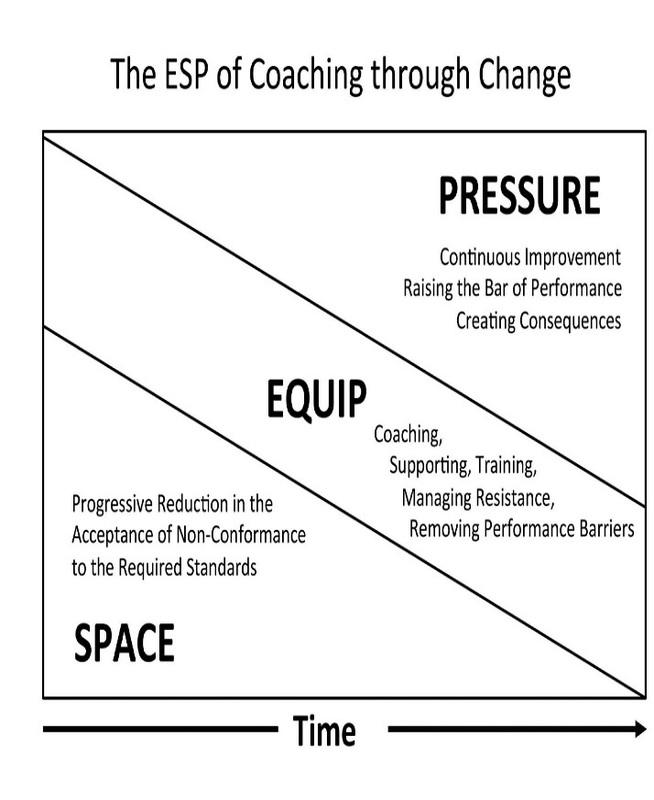 This simple ESP diagram can be useful in the facilitation of dis­cussions with management—helping them recognize the need for their personal involvement in the coaching process and their need to demonstrate consistency in expectations and consequences. At the end of the designated — and clearly communicated — time period, some individuals may fail to meet the new standards, but this should come as no surprise to them or to you. You will have walked with them through the change journey, given them the necessary coaching and support, constructively increased the pressure to con­form to expectations by reducing the wiggle room, and clearly ex­plained the consequences associated with failing to meet standards. Larry Solomon, CEO of Solomon People Solutions, managed wave after wave of fundamental change during his tenure at Cadbury-Schweppes and Dr Pepper Snapple (DPS). He served as executive vice president of human resources for DPS from 2003 to August 2013. An educator at heart, Solomon currently teaches a post-graduate MBA course on “C-Suite Leadership” at the University of Texas at Dallas. 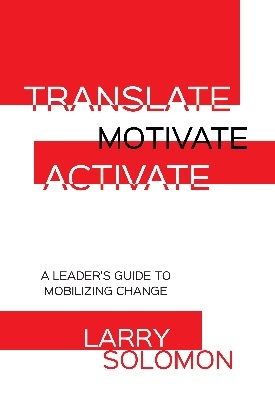 He wrote Translate, Motivate, Activate: A Leader’s Guide to Mobilizing Change as an educational tool to aid business leaders, HR professionals and MBA students to successfully achieve sustainable corporate change. All of the profits from the sales of his book are donated to My Possibilities. More information can be found at www.mypossibilities.org. Solomon received his training and development diploma from the Institute of Personnel Management in Johannesburg, South Africa, and earned an MBA from the University of Texas at Dallas. He and his wife Charmaine, have four children, Tascha, Tyron, Donovan and Kyle, and they live in Plano, Texas.